Sarah J. Conoyer received her Ph.D. in School Psychology from the University of Missouri in 2013. She completed her pre-doctoral internship through the Illinois School Psychology Internship Consortium and was placed at Township High School District 211 in Palatine, IL. During internship as well as her postdoctoral fellowship, Dr. Conoyer provided school psychological services to students and families in traditional high school settings as well as therapeutic day and residential programs. 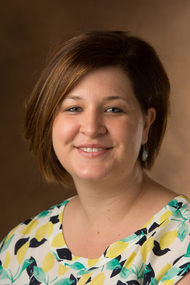 Before coming to SIUE in 2017, she was an assistant professor of psychology at the Texas A&M University – Commerce. Dr. Conoyer's research interests are in developing formative assessments to assist middle and high schools in identifying students that need extra supports, evaluating methods to monitor students at-risk for academic difficulties in content areas such as social studies and science, as well as examining how school psychologists and teachers use data to make instructional decisions. Her research has been presented at the annual meeting of the National Association of School Psychologists (NASP), the Pacific Coast Research Conference (PCRC), and the Council for Exceptional Children (CEC). Dr. Conoyer teaches courses in school psychology including cognitive assessment of children and adolescents, psychopathology of children and families, as well as undergraduate courses including psychopathology and psychological tests and measures. Dr. Conoyer is available to mentor students interested in academic assessment and intervention services for students, program evaluation and graduate studies in school or clinical child psychology. Conoyer, S. J., Lembke, E. S., Hosp, J., Espin, C. A., Hosp, M. &, Poch, A. (2017) Getting More from your maze: Examining differences in distractors. Reading & Writing Quarterly: Overcoming Learning Difficulties, 33(2), 141-154. Conoyer, S. J., Foegen, A. & Lembke, E.S. (2016) Early numeracy indicators: Examining predictive utility across years and states. Remedial and Special Education, 37(3), 159-171. Beyers, S. J., Lembke, E. S. & Curs, B. (2013) Social studies progress monitoring and intervention for middle school students. Assessment for Effective Intervention, 38(4), 224 - 235. Lembke, E. S., Hampton, D. & Beyers, S. J. (2012). Response to intervention in mathematics: Critical elements. Psychology in the Schools, 49(3), 257-272.